This week’s Sunday Million saw 8,370 players competing for $1,674,000 in prize money. The $215 buy-in tournament is held every Sunday at PokerStars and is the largest weekly guaranteed tournament online. This week there were 1,260 players that took home a piece of the prize pool with PokerStars player “avkid86” winning the July 27th, 2008 Sunday Million. Eliminations happened quickly in this week’s Sunday Million as “DonC33″ and “gio_piso” were knocked out within the first four hands of the final table. Shortly afterwards, our chip leader Jimboski30 was knocked out in 7th place but took home a respectable $29,295 in prize money. As the big blinds were up to $1 Million dapoopta went all-in with pocket deuces against eventual winner avkid86 who had As-10h in his pocket. The flop came with an Ah and that was all for dapoopta. Tonijeromi was no stranger to the final table at the Sunday Million as he had been there once before. This time however, Tonijeromi was knocked out quicker than last time as he shoved all-in pre-flop with Ks-10s against Gambooooool’s pocket threes. The flop came Jh-3h-Qd, and the river of Jc gave Gambooooool a full-house. 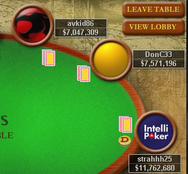 Gambooooool and Pokerbrat13 were eliminated leaving both avkid86 and strahhh25, also a member of Intellipoker. There were a number of chip leads as both players won pots back and forth. strahhh25 won a huge pot with over 77 million chips and quickly went all-in pre-flop. After 11 hours or online poker tournament action, avkid86 was the winner with 2 pair and earned $138,101 for the 1st place finish. strahhh25 took home $113,016 for the second place finish. Congratulations to the winners! If you would like to compete in the PokerStars Sunday Million, simply sign up for an account with PokerStars by downloading the software on our PokerStars Marketing Code page. 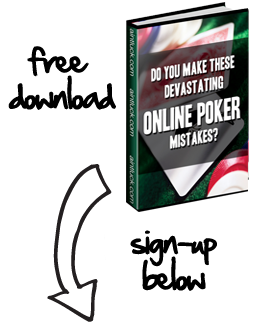 This will ensure you receive the maximum bonus offered by PokerStars. Then look for the Sunday Million tournament in the lobby each Sunday evening.